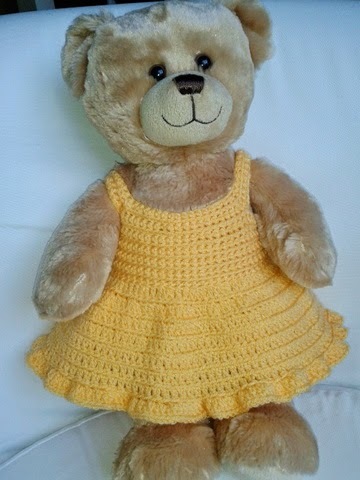 Lovely summer crochet dresses for 15" bears - great for build a bears. This is an easy crochet pattern using only double crochet and treble crochet (UK) and using less than 100g double knitting yarn. 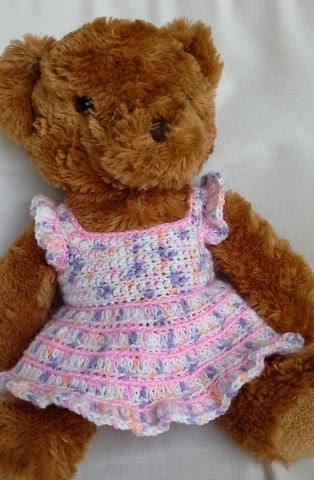 The pattern is for 3 styles of dress: A basic style, a two colour dress which I made using a budget speckled yarn and a sparkly yarn. The princess dress is again made with budget yarn and l shoestring ribbon. All patterns are made using rows for the bodice and rounds for the skirts, with a centre back opening. 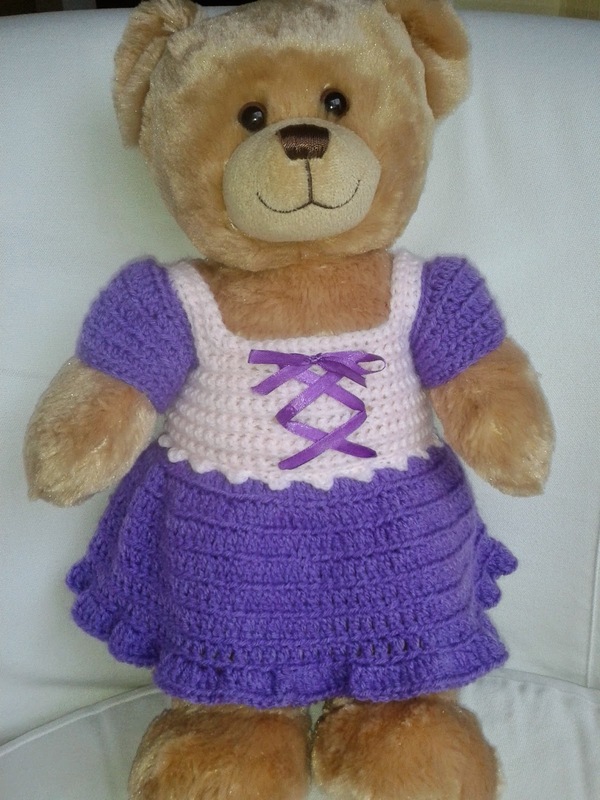 The model is my 15" build a bear cub. If you try the patterns please leave me a comment. When working double crochet rows, make one chain at beginning of row as an edge stitch - do not count this in stitch count. Using no 4.50 hook join yarn to base of bodice with right side facing. Rep last round 4 times (or length required). Next round: 3 ch, 1tr in same sp, work 2tr in each tr to end of round. Fasten off. Using no 4.50 hook join contrast yarn to base of bodice with right side facing. Next round: using main colour, 3ch, 1tr in same sp, work 2tr in each dc to end of round. Fasten off. Armhole edging: using 4mm hook and contrast work 30dcs evenly around armhole edge. Sleeves make 2 Beginning at centre of missed dc on bodice armhole, and with right side facing, join purple yarn and work 26 dc all around. Round 5: 1dc in each st around. Loosely stitch belt around waist. Thread ribbon through front bodice as on photo.